As an anime series, Trigun gained a multitude of fans across the otaku landscape before gaining a huge mainstream manga audience. Now, Trigun goes beyond the storyline laid out in the anime and the first two volumes of the manga into brand new territory! Our hero Vash the Stampede disappeared for two years after blasting a crater onto the moon orbiting the desert planet he saved from annihilation. But, with good and bad people alike trying to track him down he won’t stay lost for long! Count on more crazy gunslinger action, new dastardly villains… and a new outfit to boot! 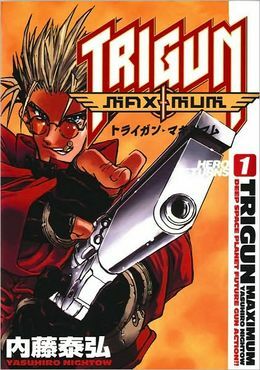 Random: Again, I’m a huge fan of the anime , Trigun, that I had to pick it up and it’s a little different than the show. Let’s meet the character cast. Vash the Stampede is the lovable blond who wants to lead a peaceful life but he is prone to causing massive amounts of destruction. He is an expert gun marksman and not quite human. Nicolas D. Wolfgang is a traveling priest who is a bit of a pessimist and carries a large (human-length) cross that is actually a gun. Meryl and Millie are insurance investigators who have a connection to Vash. The main antagonist of the series is Knives who is the brother of Vash and a ruthless murderer. 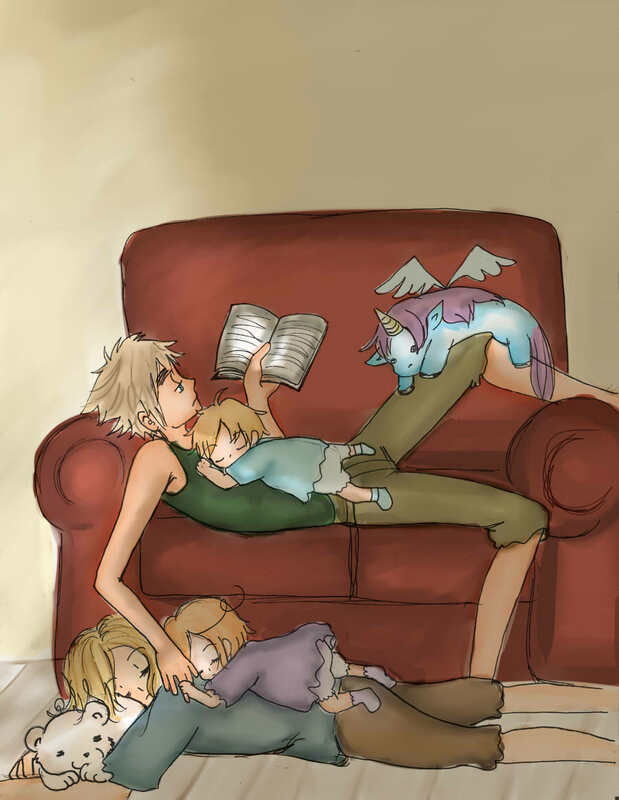 The relationship between Vash and Nicolas is quite interesting. Vash, according to the world is a trigger happy gunman, yet it is Vash who tells Nicolas “not to kill people” which is ironic because Nicolas is a priest. They are further contrasted in their beliefs about humanity; Vash is optimistic about humanity whereas Nicolas is cynical and doesn’t believe that they should help everybody that stumbles their way. Their conversations tend to be about morality and choices. This volume sets up the future volumes of Vash and Nicolas searching for Knives but it also introduces Legato who is interested in Vash as well. The main event of the manga is a hostile takeover of a train between rival families who are seeking to control a plant. The Earth is essentially a wasteland and plants provide the energy for life on Earth so whomever controls the plants are powerful individuals. Vash becomes involved because that’s the type of person he is; he is the type of to intervene in problems in hopes of solving them a little more peacefully. It further showcases two different perspective on Vash. There are those who see Vash as a destroyer of humanity but there also those who are friendly with Vash and understand that he is actually keeping them safe from his homicidal brother. Vash also shows his different sides, one as a funny and very cheerful guy. He is singing “La-la-la, Oceans of Blood” ( pg. 148) right before entering a hostage situation. His other side is the serious and deeply scarred emotional man that agonizes over the death of any human. In terms of artwork, I like it. I love the funny faces and small caricatures. There is great detail on Vash’s red outfit. The majority of the solid black comes from clothing and hair. Overall, the art is well done. There is a sense that the Earth is a barren wasteland. In the end, I’m looking forward to the next installment and seeing the reunion between Vash and Millie and Meryl. Posted on December 12, 2012, in Anime+Manga, Book Reviews and tagged anime, manga, Nicolas D. Wolfgang, science fiction, Trigun, Trigun Maximum, Vash the Stampede, western, Yasuhiro Nightow. Bookmark the permalink. Leave a comment.